17 year old Lola Nolan is a budding costume designer who lives in San Francisco with her gay dads who make her hot 22 year old rock star boyfriend Max come to brunch every Sunday so they can check up on him. Her life is pretty perfect though. 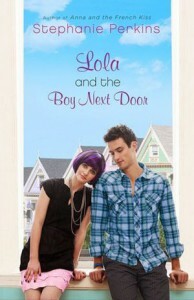 Or at least, it would be if her next door neighbor and first love Cricket Bell hadn't moved back moved back into the neighborhood.I don't usually go for contemporary romantic comedies like this, but I really enjoyed it.This book was a adorable. I had just the right amount of romance, angst and sexual tension, and I thought it handled the gradually evolving love triangle really well. There were certain aspects of Lola I found a little wish-fufilly (like the way she where a different costume and wig every day) at the beginning but I liked the way the author turned it into character development at the end. I actually felt that Lola was such an authentic teenager that some of her behavior annoyed me, or seemed overdramatic until I realized that I probably would have reacted the same way when I was 16 or 17.